Root…Root, Root for the OSS Team! ≈ Comments Off on Root…Root, Root for the OSS Team! Okay, yeah…I’m running out of ways to make clever titles for my blog entries on rooting doll hair. Sorry! 🙂 I’ve been a bit scarce here and on the doll boards for the past several days due to a re-rooting jag. 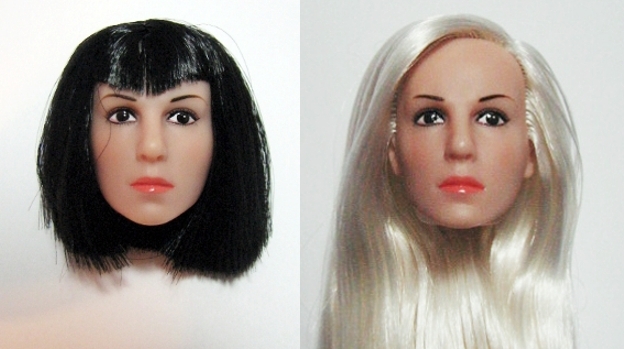 Every now and then, I find myself facing re-roots on more than one doll, and the best way to deal with it is to go silent and get busy with the needle. Not only do I suffer from dolly world withdrawals during those jags, but I also suffer from the physical pains caused by rooting doll hair in overdrive. But, I am happy to say that I’ve finished this particular rooting frenzy and am now able to get back to painting doll faces. Yayyy! 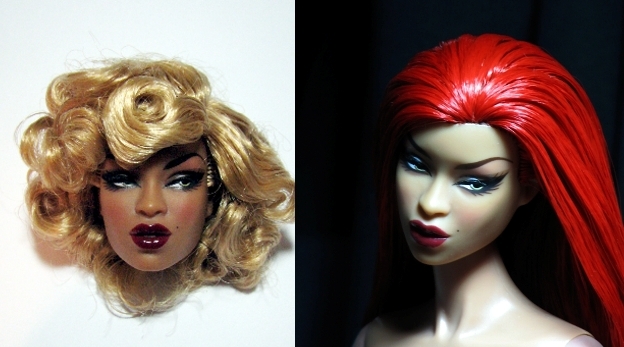 Here are the before/after pics of the 2 dolls I’m working on. neither have been repainted. I”m working on THAT part of the project today and tomorrow. Enjoy!